I read a post by Hüffenhardt titled How to Produce a Spiritual Expieriences and it got me thinking. As I pondered, I reviewed several of my own posts on the subject, Feeling the Spirit and Confirmation of the Spirit, and decided to come up with a little logic game to see if my thoughts make sense. I know from my own experience, for example, that the Holy Ghost knows some of the mathematical equations used to solve problems in thermodynamics, a branch of the sciences. I was a struggling physics student studying in a book that I still own. I keep it for historical and spiritual reasons. Halfway down a page (I could even show you where it is on the page), in the middle of some mathematics, I had a clear confirmation that what I was reading was true. It was exactly the feeling I had had come to me before as I pondered the Lord’s scriptures and that I have had many times since. So I knew that the Holy Ghost understood whatever was true in what I might be asked on an examination in thermodynamics. 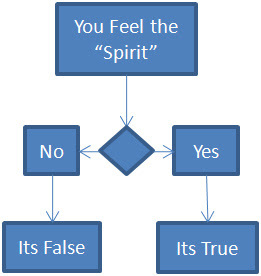 I've created the flow charts below to explain how the Church teaches what "feeling the spirit" means. Seriously! 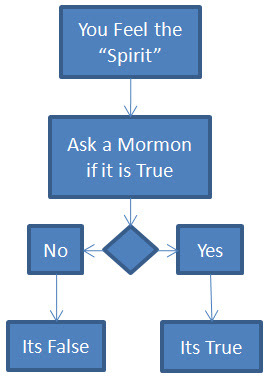 If Mormons had their way, every question to a religious subject would be answered this way because nobody would get it wrong! 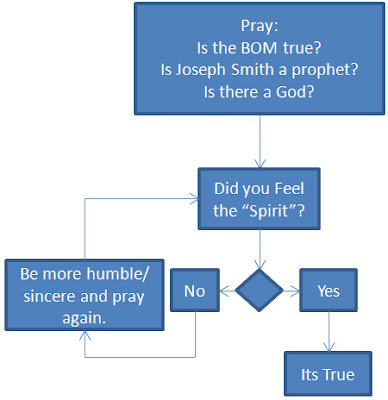 The concept of understanding truth is easy when viewed using the flowchart below. Its simple, really. If you feel the spirit, then whatever you are contemplating/pondering/viewing/hearing/reading is true. Thats the nutshell, right? Lets say that I'm watching Disney's High School Musical 2 (or as my 6 year old daughter calls it: Highsical Musical 2) and I "feel the spirit" during one of the gushy romantic songs... what does it mean? It could mean that the lyrics of the song are true, or that singing is good and wholesome, or that love is good, or that I should buy Disney stock or maybe that Vanessa Hudgens can't sing, which is true. Well, if I were to ask my TBM Mormon buddies, they would say that it doesn't mean anything. Well, if I "feel" something that has been identified by the Church as "feeling the spirit", then when I "feel" that "spirit" it should mean something, right? Wrong. It only means something when you are dealing with things of the spirit. Well, that is not right either. Just ask Henry B. Eyring (see intro reference above). This is one of the major problems I have with religion at the moment. I have been taught from my youth that the "spirit" will testify of the truth of all things. Well, all things means all things, right? It doesn't limit itself to just the Book of Mormon or Joseph Smith, it testifies of all things, which means that when I feel the spirit when listening to a 3 Doors Down CD that they are true. Since I began questioning the Church I have realized that "feeling the spirit" means nothing. I've realized that the feelings I get are a natural part of my physici, not divine messages. Now that I understand that, I've realized that in order for me to find truth, it has to make sense. The Church does not make sense to me. It used to, when I used circular logic and "he said it was true and he is a good person so I beleive him" logic or "my parents beleive it and they wouldn't lie to me" testimonies to base my beliefs on. Speaking as a computer engineer, I like your flow charts. Lays it on the line, plain as day. Jonathan, what programming language do you use most often? I do a little php. I'm thinking about writing some logic into a php script that says the same thing. Kind of a game being as much of a geek as I am. You are too kind. I'm glad that my own ramblings help someone else as I'm mainly trying to figure it all out for myself as I go.